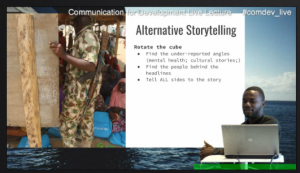 The key to crisis reporting is to ‘rotate the cube,’ Nigerian writer and journalist Eromo Egbejule shared during his ComDev lecture on February 23. 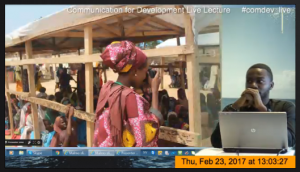 Egbejule who was at Malmö University as a visiting lecturer during February was presenting on the topic: Crisis and Culture: Storytelling in Hostile Regions (Part 1 & Part 2). 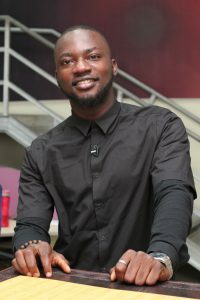 Eromo, who has reported from humanitarian front lines conflict zones, including Ebola-hit Liberia and Boko Haram-ravaged North East Nigeria, said that there are many sides to the truth and one should go beyond the headlines and traditional crisis reporting. “It is not wrong to report on the negatives but a balanced reporting that also includes the positives and unseen angles on both sides should be integrated in the narrative,” he said. This, he said, will guide against the danger of telling a single story. Two important areas he highlighted are mental health and cultural stories which are often under-reported in crisis areas. Blending in with the locals to get unreported information that mainstream media misses; circumventing army restrictions and getting into crucial territories are ways in which journalists can rotate the cube. His story on ‘Defiance on the dancefloor: clubbing in the birthplace of Boko Haram‘ is a good example of telling a more unconventional story, beyond the simple dichotomy of ‘conflict’ and ‘peace’. He admitted that while there are dangers involved in crisis reporting, there are ways to stay safe including: following security protocol and by getting attached to VIP convoys. 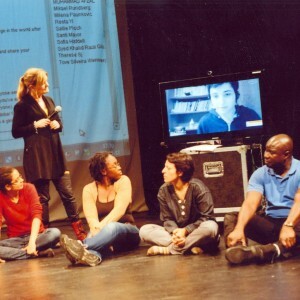 During his one-month stay in Malmö, Egbejule researched and lectured on new reporting techniques and new narratives on ‘the new Africa’ as well as the paradoxes of contemporary Nigeria. Based in Nigeria, Eromo’s work focuses on arts & culture, technology, business, human interest, conflict and the intersection with everyday living. His stories have been published in various platforms including The Guardian, Reuters, IRIN, Quartz, Africa Check and The Africa Report and have also been translated into a number of languages including French & Spanish. In 2014, he was a recipient of the Ticket Fund of the Prince Claus Fund for Culture & Development, Amsterdam and in 2016, he was a finalist in the CNN Multichoice African Journalist Awards.